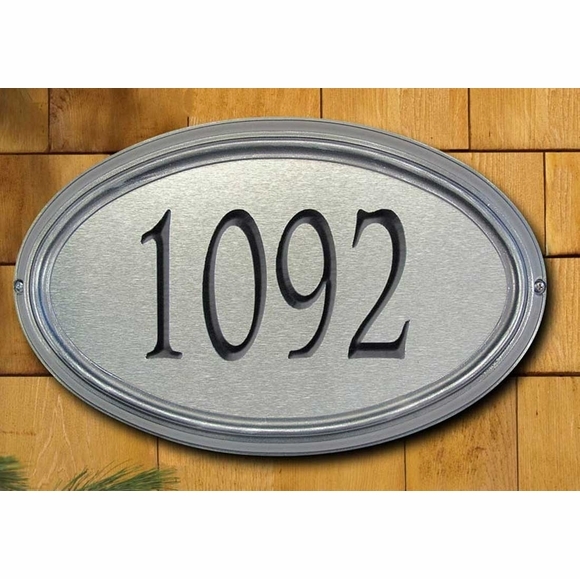 Large Oval Address Number Sign, Wall Lawn Mount - - holds up to five (5) 5.5" numbers on one line. Made in USA. Dimensional picture frame style border accents the oval shape. Two color combinations: brass & bronze with black numbers and silver & pewter with black numbers (see image above) . Dimensions: 20.5"W x 13.25"H x 1.25"D.
House number sign with large 5.5" numbers for enhanced visibility from the street.